Alongside the many returning clients that I facilitate guided bass fishing sessions for, this summer has seen an influx of anglers contacting me who are experienced fisherman in their own right, or discipline – yet have, for a variety if reasons, struggled or failed to catch a bass on a lure. Therefore, as part of a ‘summer round up’ of the learning/catches that have taken place, I wanted to highlight the accomplishments within these sessions before autumn gets underway. As always, within this post will be items of information that I hope will be useful to the reader – plus any lessons learned, new lures used, or methods and tactics that have been employed. My first client was Garry who enjoyed a memorable session back in late May when he landed three bass with the largest at 55cm here. Within a couple of days he’d contacted me again with a view to completing an 8 hour session (3 in daylight and 5 in darkness) in the last week of May. Garry retrieving a weedless soft plastic lure on one of those glorious summer evenings that became ‘the norm’ during June and July. 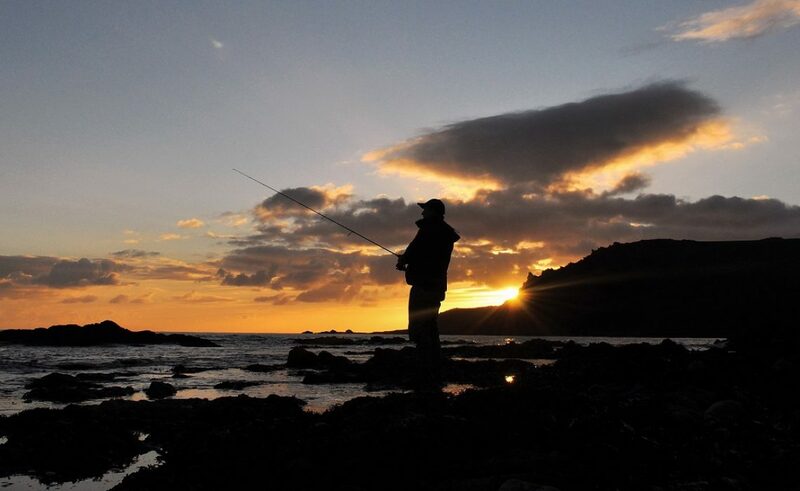 During this session we concentrated our efforts on utilising weedless soft plastics within some of the remotest and most difficult to get to coves along the South Hams coastline over low water, before settling in for the night to fish a shingle cove with a series of gullies running directly into it. A nice smile and a nice bass! This one was about as ‘pristine’ as they get – an utterly beautiful bass measuring 54cm. 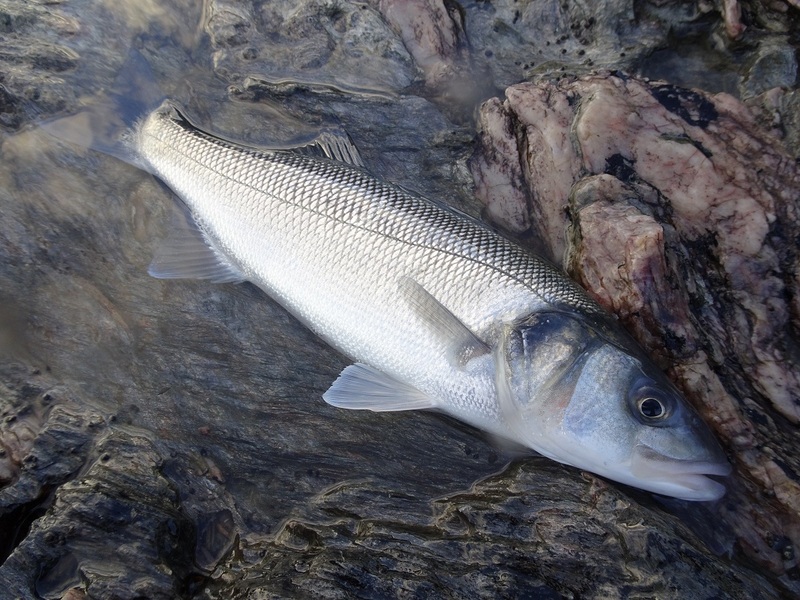 As the bright ¾ Moon began to set to our right, it very gradually created a shadow across the beach and reef, and it was within this gloomier section that the biggest bass had seemingly been waiting (within one of the gullies) ready to pounce – the Albie Snax here had proved its worth yet again! Next up, I had the pleasure of guiding Father and future Son-in-Law combination John and Ben. Both were again, experienced anglers, but so far, the bass had eluded them completely therefore, another late evening/darkness session was my suggestion in an attempt to ‘break their duck’. About as calm and tranquil as it gets as Ben works the ground in front of him. The wonderfully warm, calm and pleasant weather that persisted into July served to clear the water to ‘gin-like’ clarity levels – which ultimately influenced my overall approach. For example, I would look for tide races in which to drift or twitch soft plastics or ‘skit’ small surface lures into. Also, I would endeavour to guide my clients within rocky, weedy, inlets that the bass often feel safe to slink into – terrorising any small fish present. Indeed, on one of these sessions a large bass was witnessed swirling and chasing what I believe were immature pollack inside a tiny cove and in only inches of water. As darkness set in during this session, John and Ben were extremely unlucky to be broken off twice (once each) after hooking bass on the Albie Snax, whereby the fish unfortunately managed to drag the braid over the well scattered pinnacles of rock that were only inches beneath the surface. However, eventually one ‘stuck’ and John managed to land a small bass – one that as you can see from the photograph below made him extremely happy! John’s first ever bass! The fact that it was caught on a lure and in darkness made it all the more special for him, as he was really looking forward to trying this method having read so much about it. Over the next couple of days a client who has become a good friend of mine sportingly hiked (despite being in his 70s) over a good 7 miles of the south-west coastal path as I did my utmost to find him some bass. With the water temperature so high (due to the hot weather of course) it appeared that the larger specimens had taken a vacation away from my south Devon marks – but through perseverance and lots of laughs and anecdotes we eventually found a few pockets of small fish, caught on the surface lures. What a setting! If I am still walking across rocks and fishing as hard as this guy does when I am 70 I will be a very, very happy Man! With a sequence of tides falling perfectly for an assault on a very shallow sandy beach in darkness, it was with the Jim’s Lures Needlefish here that Dave managed to snaffle a couple of slightly larger 2½lb bass in the surf. What was extremely pleasing was that he’d never have dreamt of fishing such a venue and with such an innocuous looking lure therefore, to accomplish both and land his first ever bass on the ‘needle’ brought that brilliant smile to his face – well done mate. The white needlefish, retrieved through the gentle surf tables accounted for this bass. To say this bass was well deserved is an understatement! But we got there in the end. Father and Son ‘combos’ have become a regular occurrence in my bookings this year (you might recall the 69cm bass the Son caught back in May here) and it was on another one of those hot and sticky summer evenings that we embarked on our quest to catch that ‘first ever bass’ on a lure. What a summer we’ve experienced (we deserved it after the winter we had!) with scenes like this being my staple ‘dusk’ conditions – marvellous. I remember this session well, as it was another occasion when I/we witnessed bass visibly feeding – something that isn’t all that common in my neck of the woods. This time, as Steve (the Son) was working a small surface lure around the boundary of a tide race I spotted a bass take something ‘off the top’ in quite deep water (15ft). What occurred next was bloody exciting for me, let alone for my client as he cast in the direction of the ‘boil on the surface’ and we proceeded to watch a fish almost ‘play’ with the lure via tapping it with it’s nose and jump over it. To receive hugs from two Rugby players at the same time on a deserted beach at midnight is something I won’t forget in a hurry! Joking aside, the way in which James and is friend Tom doggedly went about their fishing makes what I do all the more easier to perform. Every single instruction was followed to the letter by these avid Carp anglers as they worked surface lures, weedless soft plastics and shallow divers over all manner of terrain during the late afternoon and evening. With only 45 minutes of the session and the flooding tide remaining it was James who experienced the first bite (and hook up) on one the Jim’s Lures Needlefish. I was astonished to see a bass barely the same size as the lure dangling from the lure but (and I wish I’d videoed it) you would have thought James had caught a 5 pounder given the way he admired it and delicately released it back into the shallows – he was really happy as this was also the first bass either of them had ever caught. Moments later, I saw Tom’s ‘main-beam’ suddenly appear 50m up the shingle – had he caught one? Sprinting (in waders which isn’t easy to do) I was really hoping to find him stood with the rod curved and the drag singing, but no, even better than that he’d landed a 3lb bass that was now at his feet and that had nailed an Albie Snax about 5m out. It was great moment, that was (as far as James was concerned) had rounded off the perfect session – but there was more to come… Second cast back on his mark, the rod bounced over and the drag gave a couple of metres of line – this was a proper one! I’d commented that a shoal could well be swimming across the reef and in the flow of the tide (Tom had been positioned further up-tide so to speak) and sure enough, here, James was battling with something seriously scrapping on the other end. “Treat it like a big Carp” I said as it neared the shingle and began to power to the left whereby I managed to grab the leader and guide it ashore. This bass measured 56cm (around 4lb) and really was the cherry on top of what had turned out to be a great session with more friends made and bass caught. Following a couple of fantastic guided sessions in which my clients caught some lovely bass on surface lures during the evening high tides here and here I welcomed Husband and Wife (Danny and Pauline) from north Devon, down to south Devon. The owners of High Street Tackle in Ilfracombe here my remit was to teach them as much as possible about the types of ground bass frequent, in addition to ‘how to work and retrieve’ certain lure types, both in daylight and most importantly, in darkness. A small one and a smile – but within a week or so he’d landed a 70cm bass from one of his own marks. Both of them had really struggled to find any consistency to their bass fishing, both on lures and bait therefore, it was very satisfying from my perspective to stand Danny in the gorge that he would later catch a bass within once the tide had flooded into it. It gave them a huge boost to understand what ‘makes’ a potentially good bass mark, alongside the realisation that they had a number of similar marks practically on their doorstep. A returning client (Mark) paid me a visit the following evening with the full intention of giving his own collection of Albie Snax lures a thorough dunking! Last time out, he’d landed a 58cm bass here (his PB at the time) therefore, I took a chance and guided him on a section of coastline that is exceptionally difficult to access – a decision that turned out to be a good move. We arrived just as the sea had reached the shingle, subsequent to it flooding over a flat expanse of reef/weed/rock pools just tucked out of the main flow of what is a pretty potent current. As it was so calm, I convinced Mark that a senko was a more appropriate lure to commence the session with and within 20 minutes he’d landed the bass below. A great start to a session that went precisely to plan. About an hour later, and with about 2 hours of the flood remaining, it went a little quiet. Therefore, with the depth of water having increased over a particular feature (a scour in the reef set at an angle to the shoreline) we moved 20m along the shingle in order to target the area – this time with one of his beloved ‘Albie’s’ attached. First cast – WALLOP – and a 2½lb bass hit the shingle following an awesome battle against his 7′ 9″ high end Graphite Leader Tiro lure here rod and Shimano Sustain reel here. Within minutes he’d latched into another one that was ‘hell-bent’ on swimming amongst a group of rocks to our left, but Mark (who has caught bass up to 63cm having been bitten by the night lure fishing bug since our previous session) did a great job of turning and landing this one (below) of around 4lb. I really enjoyed this session, as it’s always great to guide former clients again and to witness how far they’ve come in regards to their expertise and confidence. Look at the ‘spade-like’ tail on this one! No wonder it had me thinking it was a really big bass by the way it wrenched a few metres of braid off the spool. A splendid 4lb bass in mint condition – Mark’s ability to place a lure and work/retrieve it in the correct way has resulted in some great catches this season. “I’ve never caught a bass Marc” was Tim’s response to my question of whether he’d caught one on lures before – which made it all the more sweeter that he managed to land two during the session. What’s more, the first came on his first ‘proper’ cast after he’d mastered the art of retrieving a small surface lure ‘walk the dog’ style. A happy Tim fishing moments after he’d landed his first ever bass. Despite a few more ‘boils’ close to lure, as dusk set in I decided that he should try a mark a further 100m around the rocks before it became too dark. I positioned him on a short peninsula of rock that would enable him to manoeuvre the surface lure (a Seaspin Pro 120 here) between two ‘car sized’ outcrops of rock – the type that bass will routinely position themselves at the foot of in order to pick off items moving in the current. First cast – and as I was opening the net, all I heard was the drag and line zipping off of his spool! Despite not being able to see the lure popping and turning on the surface, the fact that he’d become so adept at it in such a short space of time meant that the lure was working perfectly – and to the fancy of whatever had grabbed it! An experienced trout/fly angler, I’d told him to ‘play’ the bass as if it were a big trout (something that he did brilliantly in the tight spot in which he’d hooked it) as I expectantly waited for the 4lb+ bass to appear. It was a pity that it went quiet once he’d commenced fishing into the night as I did think he would catch a few given the conditions – however, it augments my theory that when there are so many baitfish around, that maybe they ‘don’t need to move’ into the shallows under the cover of darkness as they’ve already had their ‘feed’? Tim’s second ever bass, taken deep into dusk following a short but accurate cast – absolutely brilliant! It wasn’t the big one I was expecting though! John was another returning client (who’d caught a 6lb+ beauty with me previously here) who’d decided to bring his friend Mark along for round two. I’d planned for them to fish 4 hours in daylight and 4 in darkness (the composition of which is very popular with a lot of my clients) with once again, small-medium sized surface lures and diving minnows being are our main line of attack in the bubbling, frenzied water that was breaking around the rocks at low water. For me, nothing beats teaching a client a new method and then watching them catch a bass – which is precisely what Mark did, again and again with the various types of surface lures he’d brought along by simply letting it to rest momentarily between bouts of it splashing and being allowed to ‘wash’ around in the eddies very close to his stance. Into darkness, and with a very eerily looking Moon intermittently revealing itself between the low cloud and mist, it took only minutes before John hooked and beached a small one on the needle. Casting and retrieving needlefish into 2-3ft of water was yet another ‘new method’ for Mark, and one that he took to exceptionally well – and I was chuffed to bits when he landed two bass in succession (again only small at 1½lb each). The real drama however was to take place 50m around the rocks. Summoning John, we embarked on a brief scramble over ‘safe’ flat, dry rocks in order to access a cove only 30m wide, with high rocks either side and completely sheltered from the influence of the tide – the type that I know bass will investigate or sit and wait for an easy meal to appear… First cast – a slight knock, second cast and the rod THUMPED downwards as the drag gave an instant 4m of line as an angry bass well and truly ‘nailed’ the white needlefish in 2ft of water, over a clean sand/flat rock seabed and only 10m from his feet. A p****d off bass if ever I saw one! My head-torch was turned on in a flash, as I was slightly concerned the fish would head left and towards a large (mini-bus sized) and exceptionally ‘craggy’ rock but instead, the bass boiled on the surface, showed us its flank and headed right – all of which was caught in the beam (this would have made a fantastic short video and something I might complete next season). With the sudden run for the boulders on the right hand side of the beach ‘checked’ John masterfully brought the bass close enough to the shoreline for a small wave to bring it up the sand. It was a cracker – with a light coloured back (which is an indication that it has spent most of it’s recent life hunting over sand) and with its spines and gill-plates flared in readiness to pierce my hands and fingers as I gingerly unhooked her with the pliers. The video below captures the moment bass number fifteen for the session is returned – one which really made all of our night. In between the sessions above there has been a lot of small bass caught, in addition to a couple of 5-6lb bass being lost in the final seconds… In the month of August, although I have only managed to complete six solo sessions I have caught some nice ones too (including one of 62cm) that I’ll cover in my next post. Furthermore, I had a client (Andrew) who spent two days being guided by me, in which he landed a total of fourteen bass up to 4lb – the story of which I will endeavour to write about in the coming week. Next Client Catches – The red-letter day!